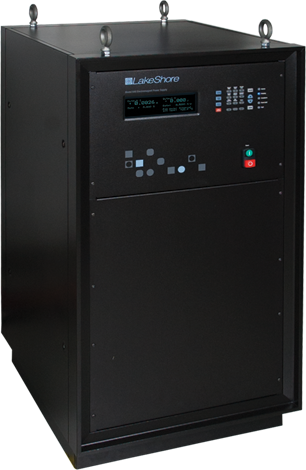 The Model 648 electromagnet power supply is a robust, fault-tolerant 9 kW supply optimized for powering large 7 or 10 in research electromagnets. It is specifically designed for high precision laboratory use requiring extremely low electrical noise. The linear design removes undesirable higher frequency noise typical of switch mode power supplies. Eliminating the need for external switching or operator intervention to reverse current polarity, the Model 648 uses convenient bipolar, 4-quadrant operation. It is capable of supplying ±135 A/±75 V to a nominal 0.5 Ω, 0.5 H load. The Model 648 is built to last with a rugged design, integrated fault protection, and a simple, clean interior electronic design. This robust power supply is developed to minimize downtime. It uses worry-free water cooling for quiet efficient operation compared to air-cooled power supplies. The seamless water lines only have external junctions, eliminating internal water leaks. In addition, safety interlocks ensure that cooling water is always flowing to the supply while operating. Magnet water can also be interlocked into the power supply if desired. Internal software controls manage water usage intelligently. Please contact Lake Shore if you are interested in a Model 648.